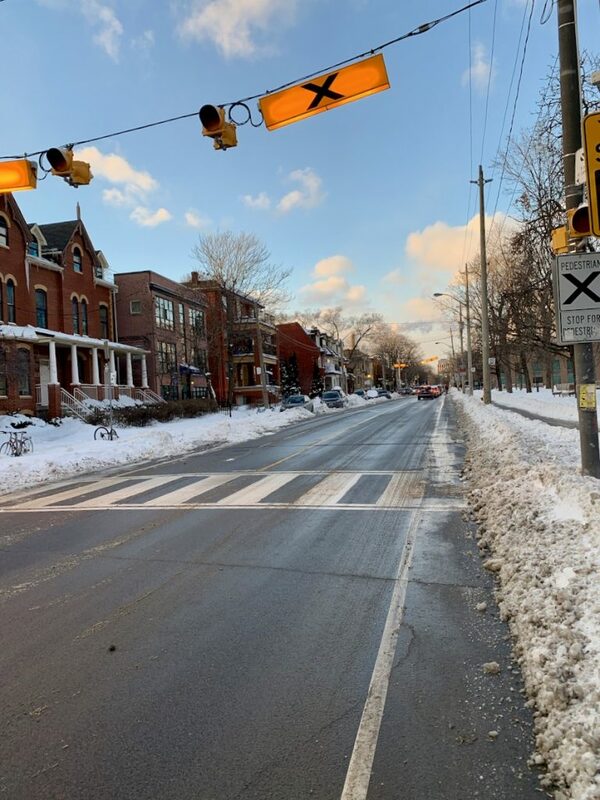 This past Monday and Tuesday, Toronto was hit with the biggest single snowfall of the 2018-2019 winter season so far. 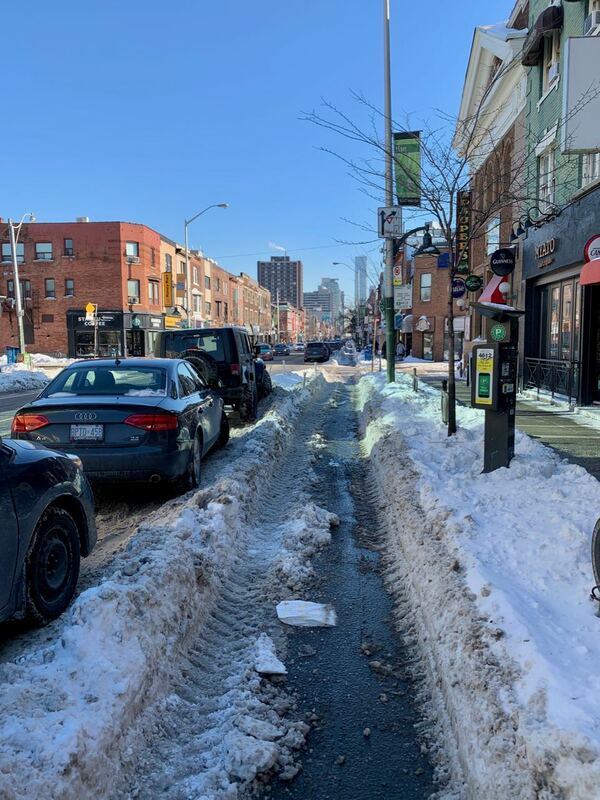 The city's stated policy was to prioritize snow clearance on several bike routes in the downtown area. 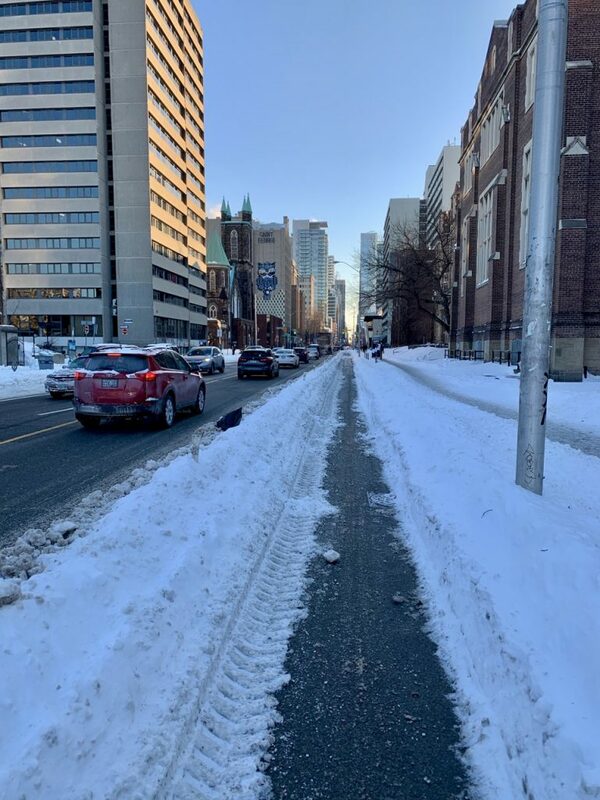 Given that it has been two days since the storm, we decided to take a look at how the city has been doing in keeping a few of their designated bike routes clear and safe. 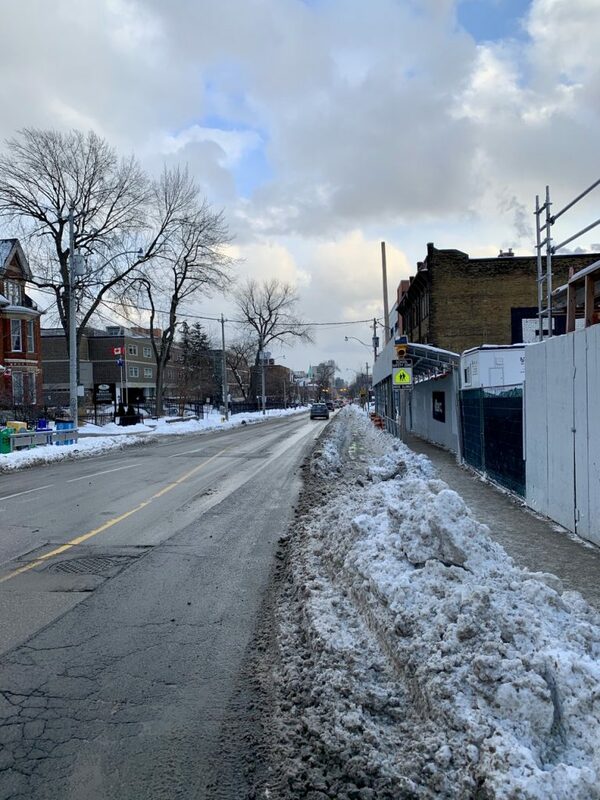 First up, the Bloor bike lane. 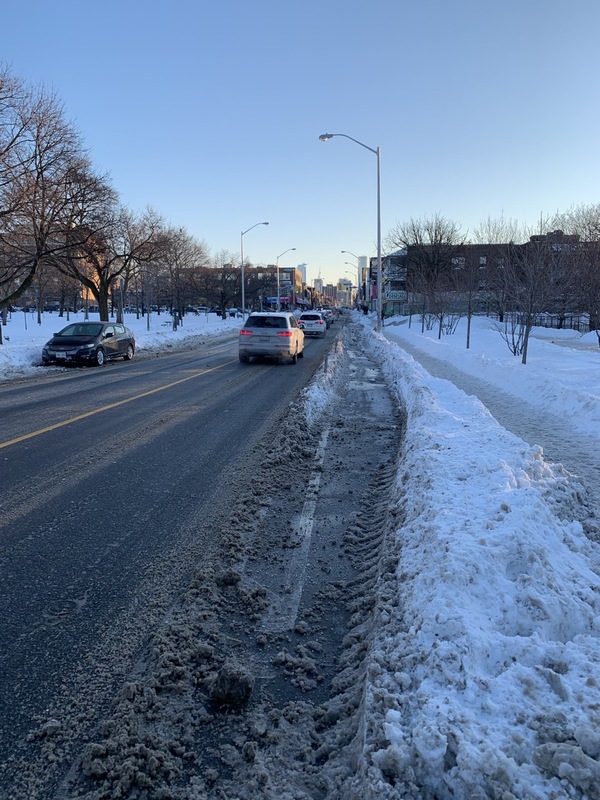 Here, below you can see that although the bike lane has clearly been plowed, there is some snow present, and the car traffic lane is totally clear and looks more inviting. 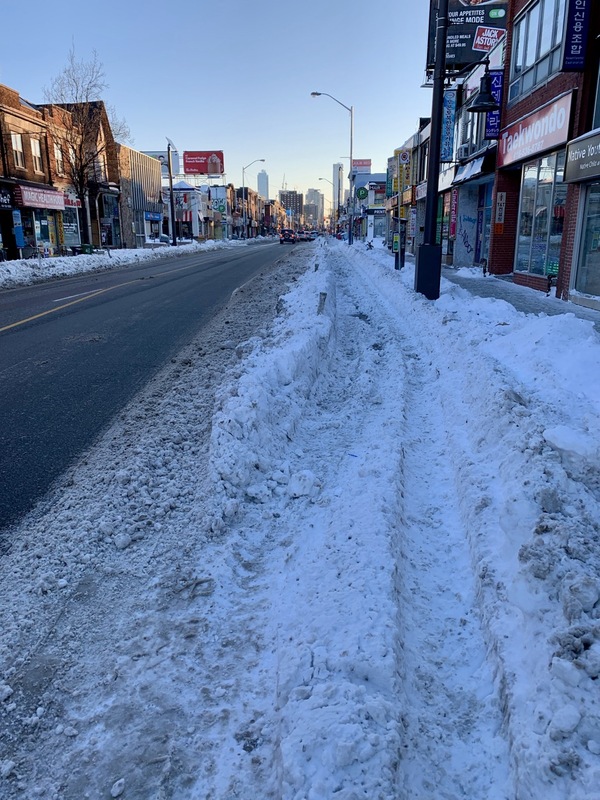 A little further east, the bike lane starts looking impassable in sections. 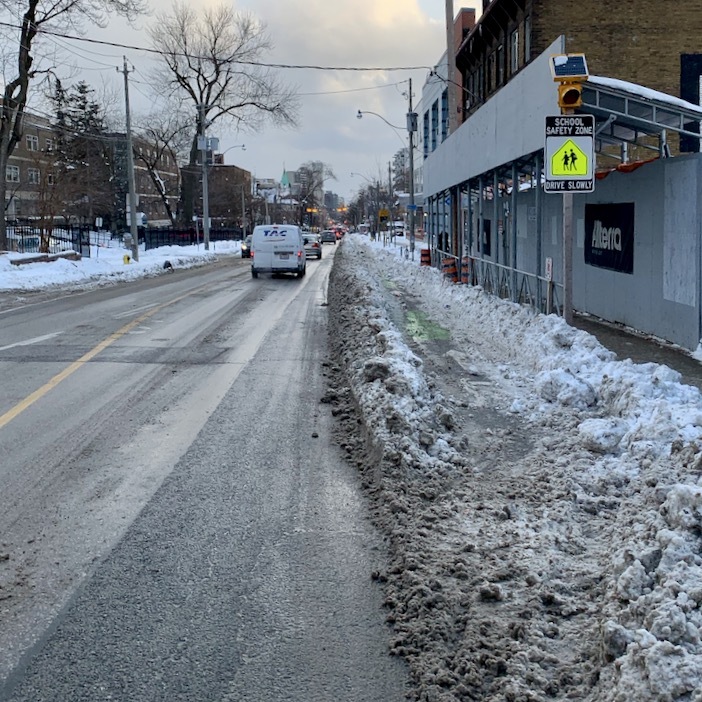 On the other hand, on the section east of Spadina, the bike lane is considerably wider, and here they do a great job of keeping it clear and salted. 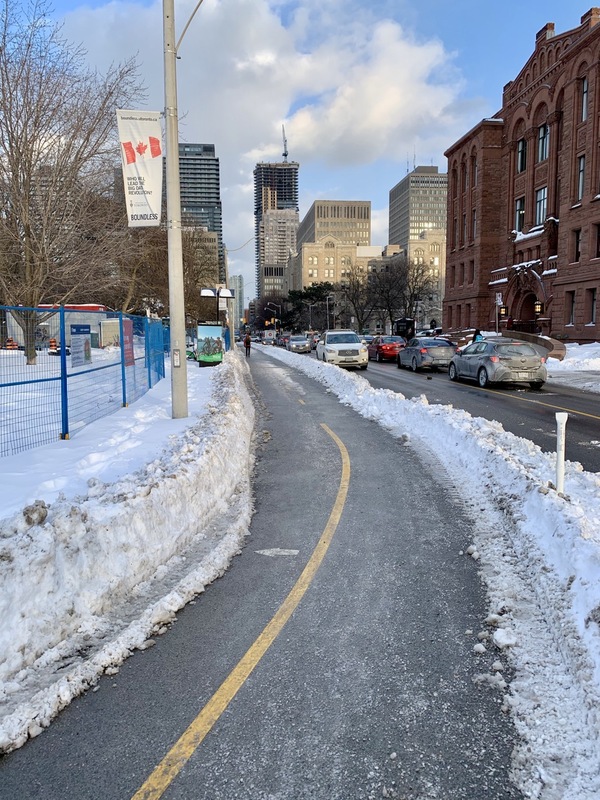 The snowbank to the left offers a reassuring amount of protection from traffic. One can dream about a permanent barrier of about the same height. Bloor gets an overall Grade of C.
Next up: Wellesley, headed east. The bidirectional section through Queen's Park is very nicely maintained. Unfortunately, past Yonge there is a section with just sharrows, and as one might expect, you have to mix it up with traffic. Past Church, things get better, but there are still sections like this one where condo construction has eliminated the sidewalk. Overall, Wellesley gets a B-. 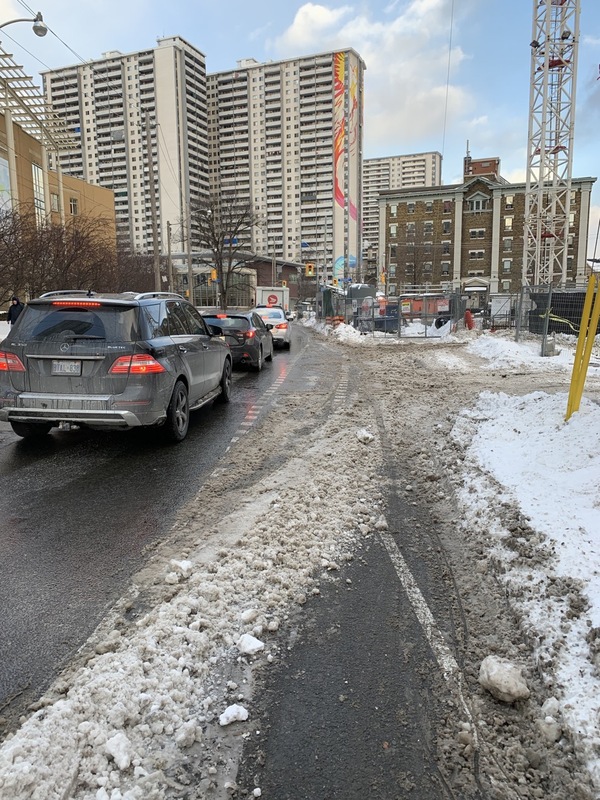 Turning south on Sherbourne, the bike lane does not look inviting. 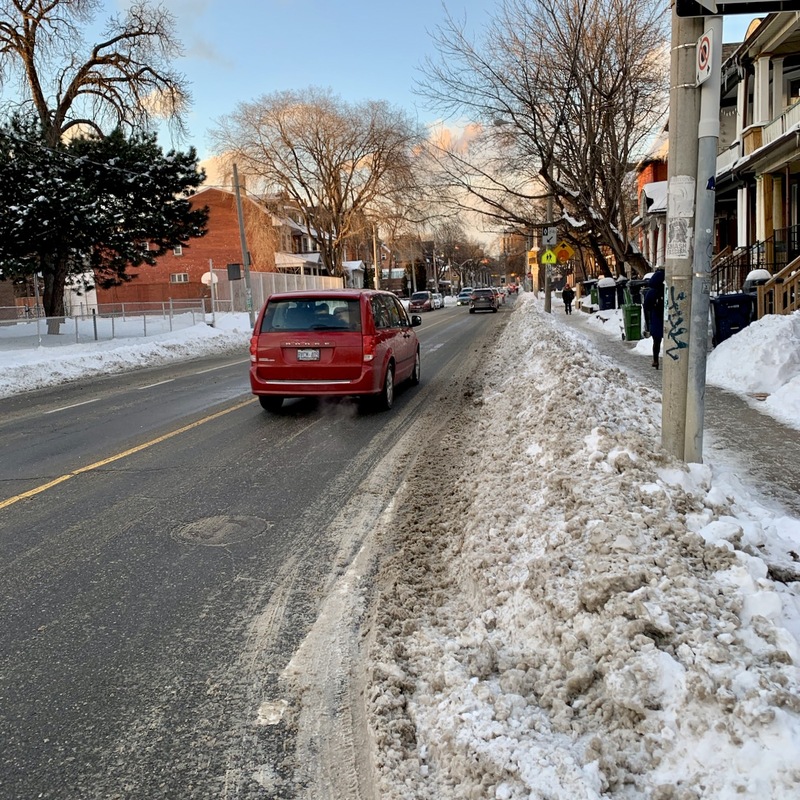 Turning west on Richmond, once again there is a large section of uncleared snow. Once you got past the uncleared section, things got much better. Still, there continue to be some issues at intersections where the separated portions of the bike lanes begin and end. At this corner, you have to mingle with cars turning right. 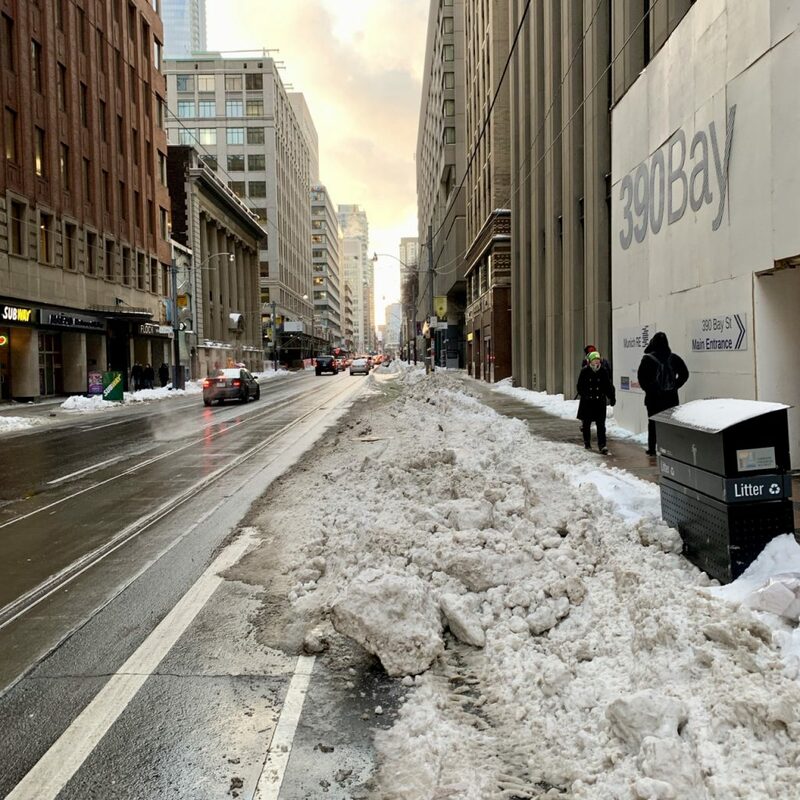 Some of the uncleared sections were associated with bus stops, but others like this one just west of Bay don't seem to have any reason to be there. Given that the majority of the lane was clear, I'd give Richmond a B. 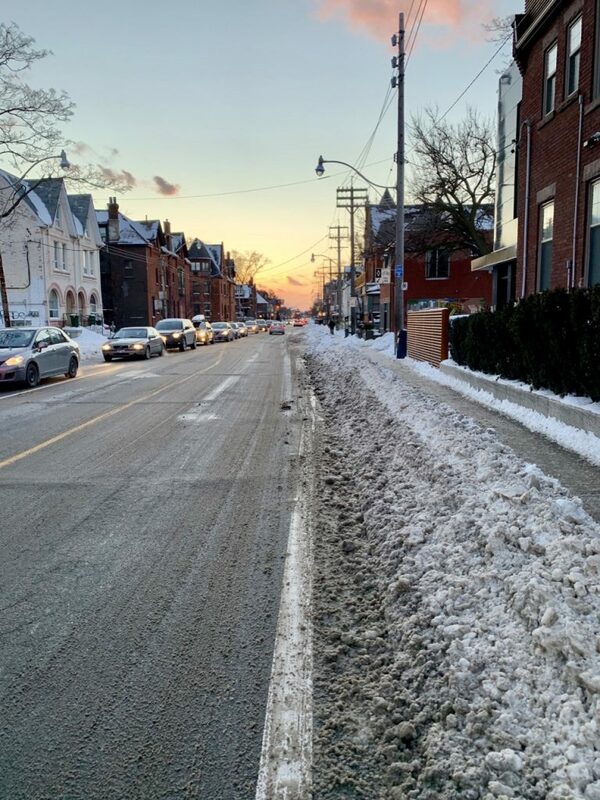 Bonus points for the fact that City Council voted 22-0 to make the Richmond and Adelaide bike lanes permanent this week. Okay forget what I said about the non parking side being mostly clear. 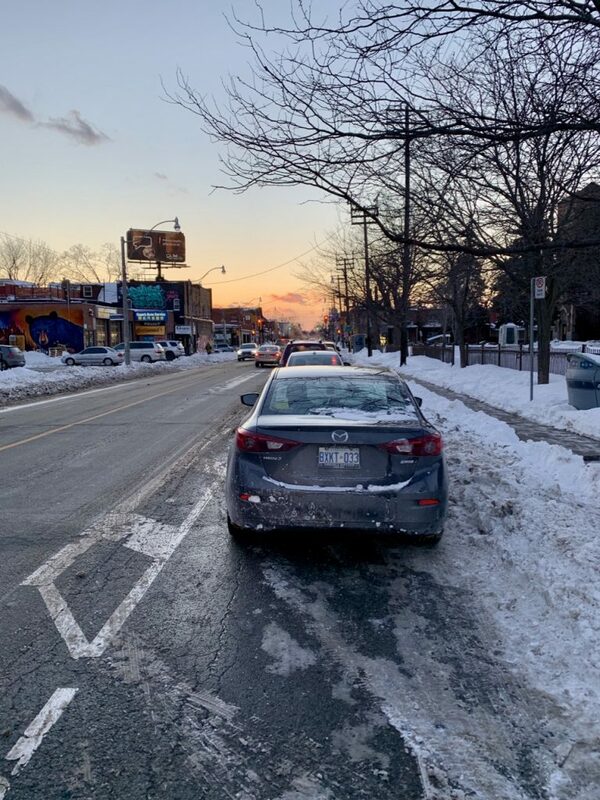 Even worse, with the street being narrowed by the snow, cars were parked in the bike lane. Harbord rates a C-. 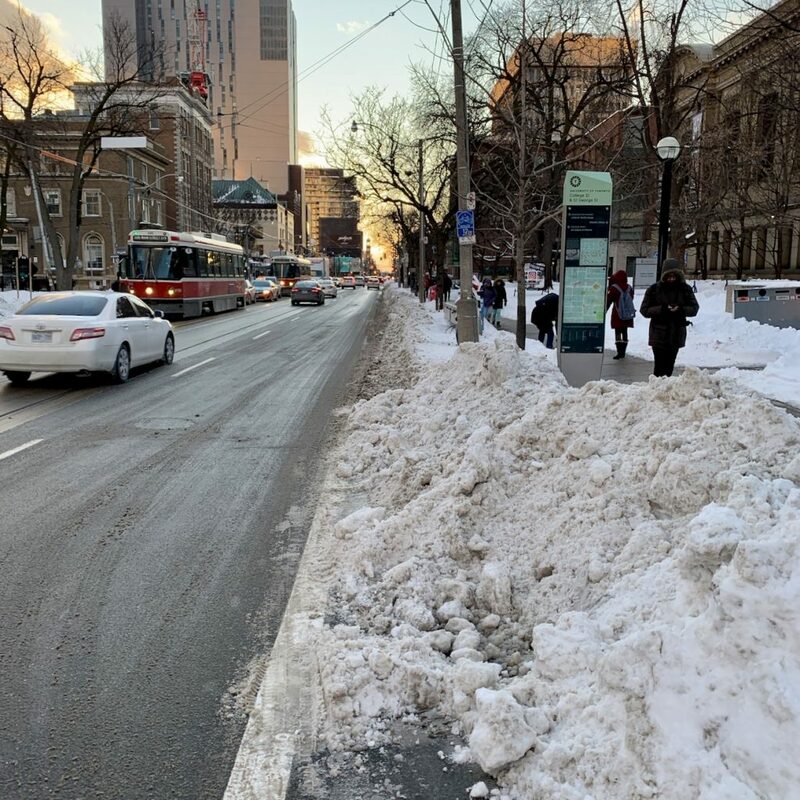 Bottom line: the main streets downtown are well plowed for car traffic. 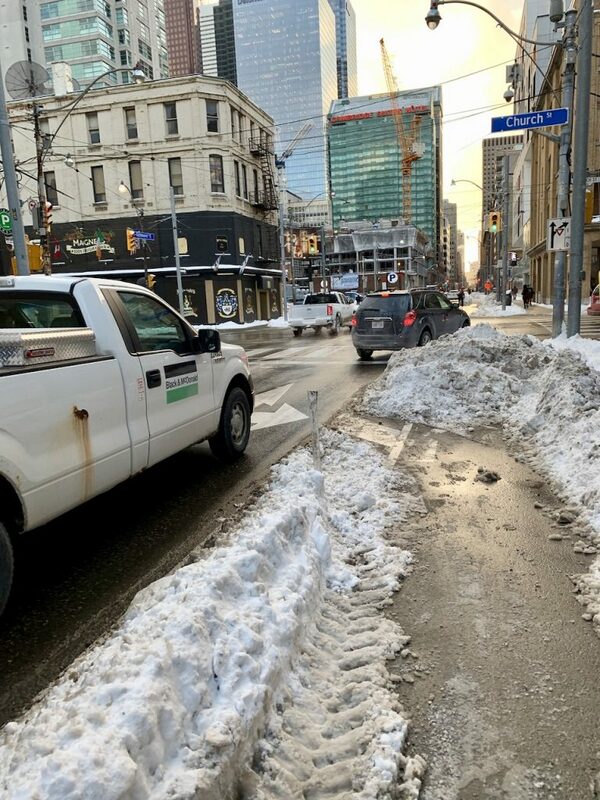 However, the cleaning of bike lanes can be described as inconsistent and indifferent. 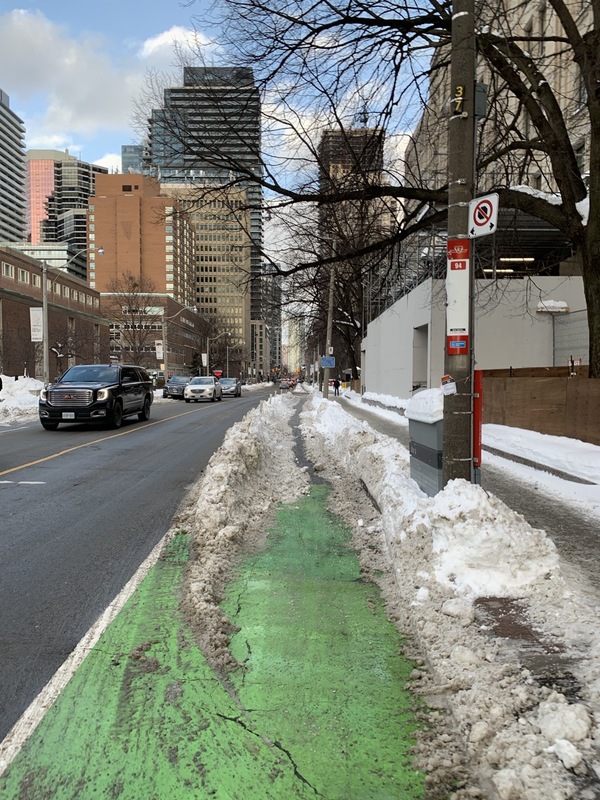 The best winter maintenance was on sections of separated bike lanes, with sections of Wellesley, Richmond, Sherbourne and even Bloor being a pleasure to ride. 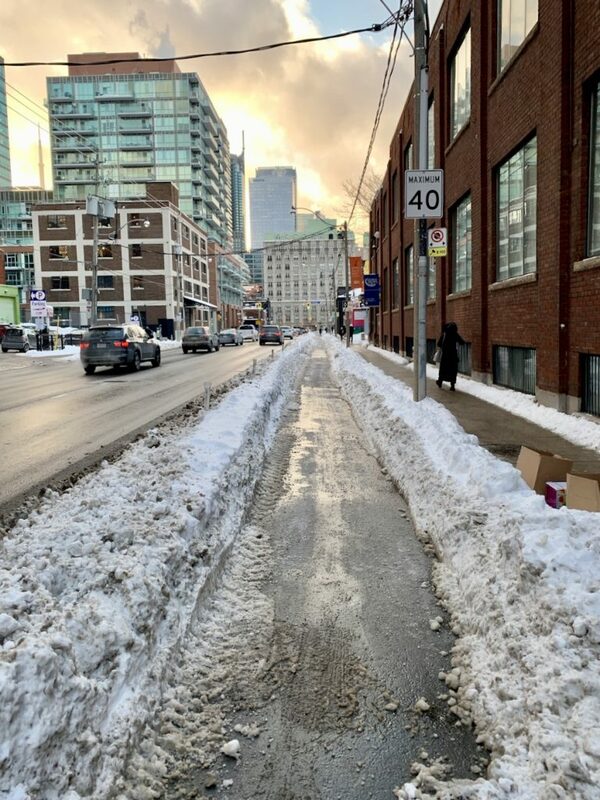 The only exceptions to this trend were the narrower sections of the Bloor bike lane between Spadina and Christie where it appears that they use a very narrow track vehicle to clear the lane - and it does not do an adequate job of snow clearance in these narrow lanes. 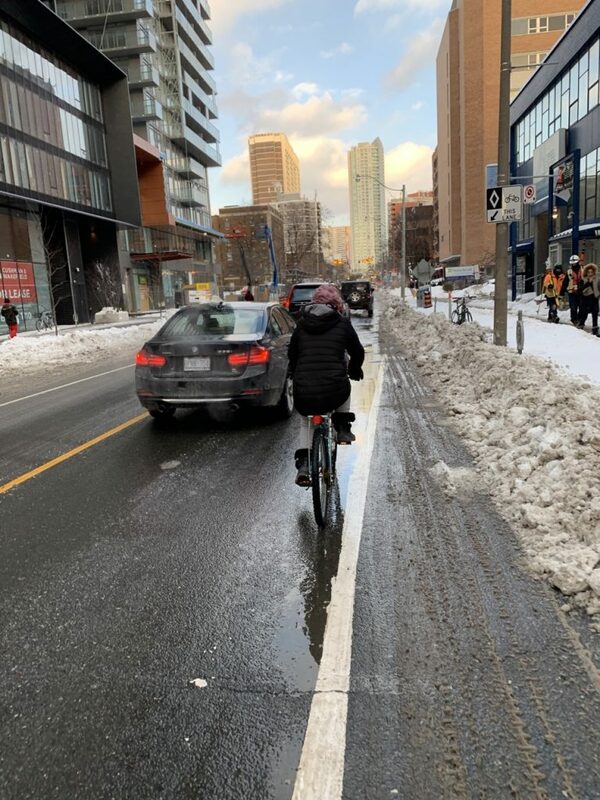 One other thing that I noted while biking around in -15°C weather Thursday was that there were more cyclists riding that I have generally seen in previous years. The other thing that I noticed was that over the past two weeks of wintry weather, I've not had any cars honk at me. Drivers have been very patient. Keep warm and ride safe everyone! 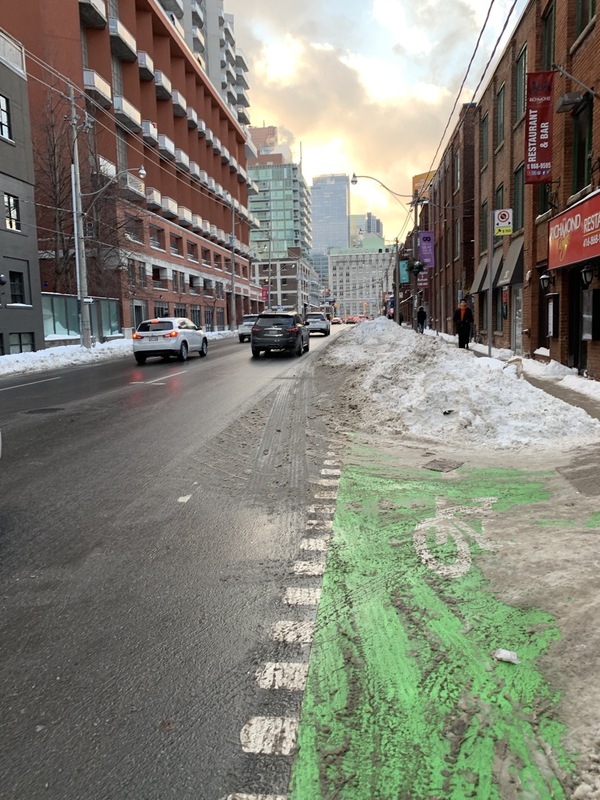 If you are so inclined, come ride with Cycle Toronto on their annual "Coldest Day of the Year Ride" on Saturday, February 2. The forecast indicates that it actually won't be anywhere near the coldest day of the year.